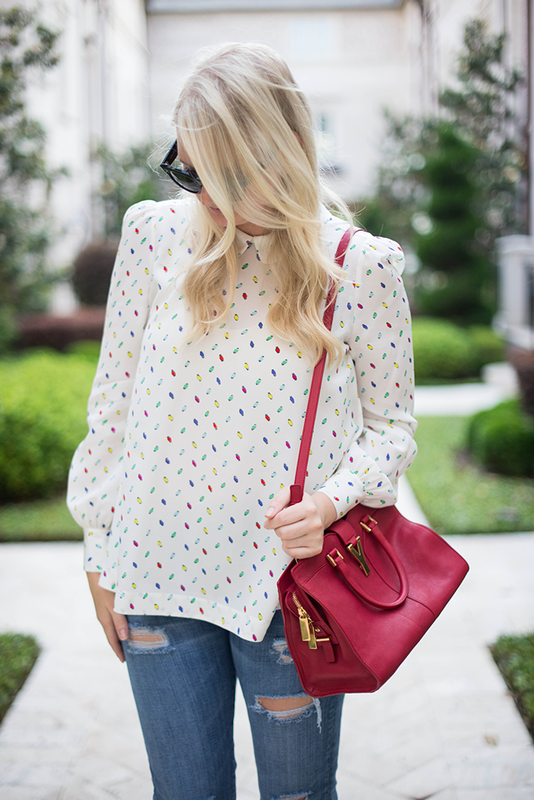 One of my favorite blouses in my closet these days is this Kate Spade Hollis top (on sale!! ), simply because it goes with every color I own. You can’t tell how colorful it is from far away, but get close and you’ll realize this blouse contains bits of cobalt, bright red, turquoise, yellow, magenta and sea-foam green. Even though it’s a fun print, it really is one of the most versatile pieces I own. You may remember it from this more tailored, sophisticated look here, but today I’m wearing it with my favorite boyfriend jeans and strappy sandals (that are also on sale, by the way) for a more relaxed vibe. It picks up the bright blue and vivid red of my bag and sandals just perfectly, don’t you think? PS – I hope you’re keeping up with my trip to NYC on Instagram! So far I’ve had drinks with Iris Apfel (bucket list, much?! ), met the fashion director and editors at The New York Times Style Magazine (T Magazine), hung out with jewelry designer Alexis Bittar, and got a behind-the-scenes look at Bergdorf Goodman by David Battane and Linda Fargo. It’s been a real treat! Click here to follow me on Instagram and get real-time updates on my travels. This blouse is the cutest thing, have fun in NYC! 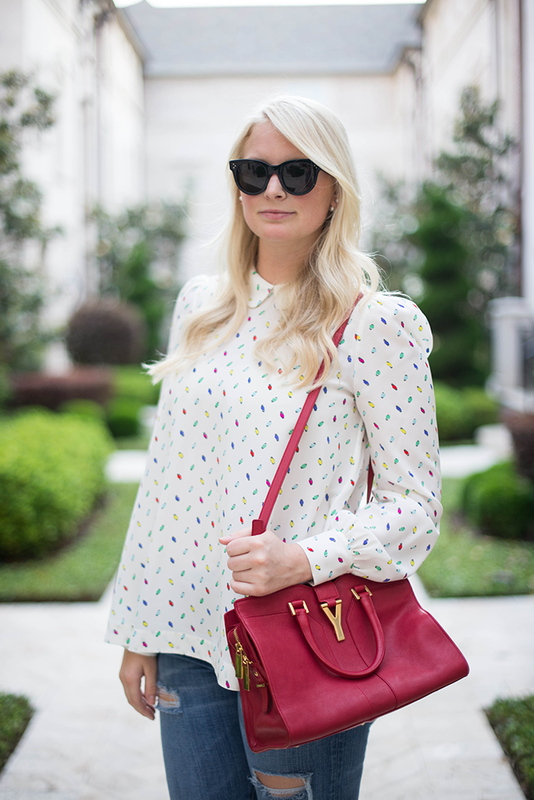 Such a fun print and I love the peter pan collar – great look! I love this casual look from head to toe! Those are the best boyfriend jeans I I love how you rolled them with the heel. Your casual looks are some of my favorites! You have been killing it with your looks lately! 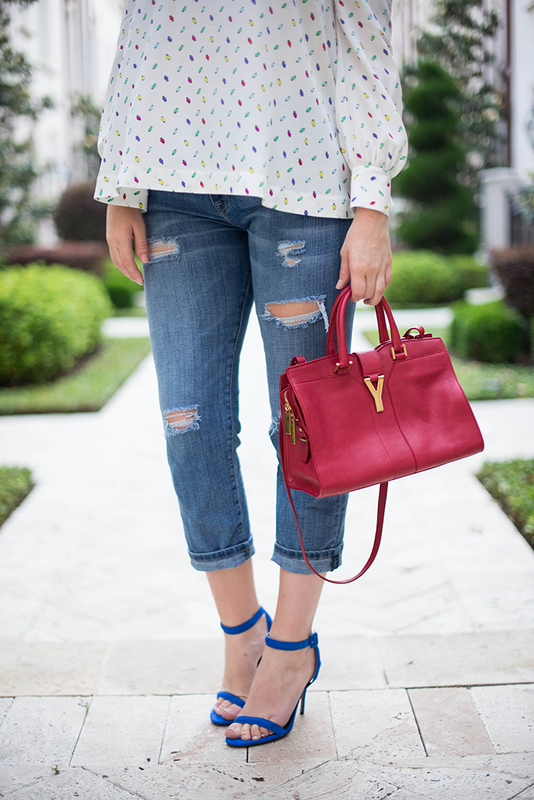 Love this top and those jeans – and of course the bag, YSL can do no wrong. Loving those shoes!!! That print is so fun too! what a fun piece! I usually stick to neutrals but I also have a white blouse with neon coral kitties all over it that seems to work with so much and I love it! Loving the combo, the bag is perfect! Your handbag collection is insane, I seriously love every single one of them! Have so much fun in NYC, and I’m so jealous that you ran into Olivia Palermo! Love the denim jeans! I Just remembered I have a new pair hanging in my closet! Love following you on Instagram! Have fun! Sounds like your NY trip is amazing, have so much fun. I love this look from head to toe! 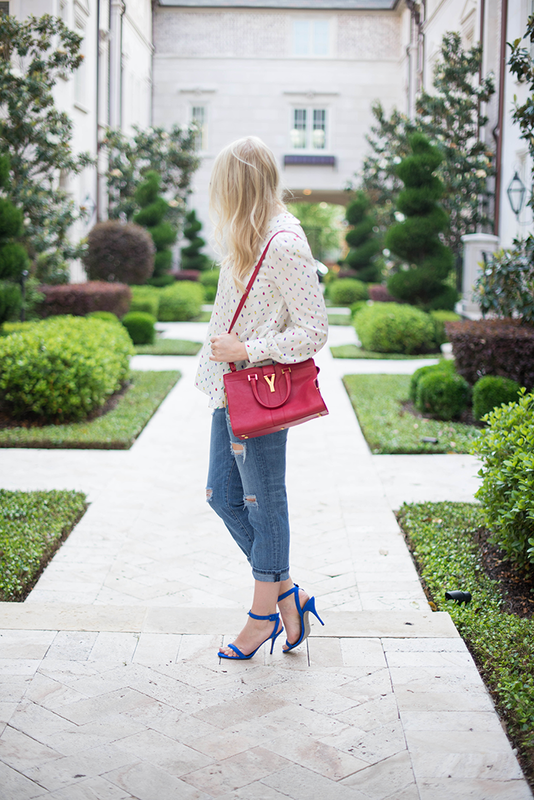 Coveting those boyfriend jeans! And swooning over that YSL tote! That shirt is too cute!! 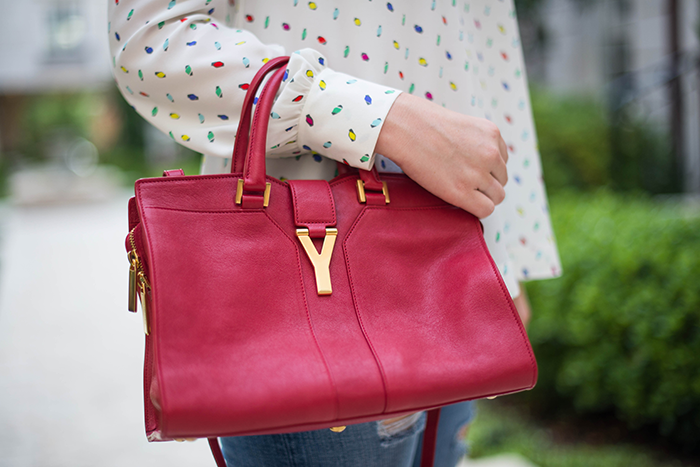 I am loving your YSL bag – I didn’t know it came mini-sized!! It is perfect with those gorgeous blue heels! Love the look & how you drew out two of the colors with your bag and shoes! Hope you’re having a great time in NYC! Love those jeans & that top is so fun! what a gorgeous top, and i love the way you styled it with the distressed jeans to keep it from feeling too precious. i haven’t been on instagram much these past couple days and clearly i missed out…iris aprel?! linda fargo?! such a dream! This top is so cute! I love how your bag and shoes pick up the colors in the top! It looks like you are having a great time in NYC!